I am so, so excited for this weekend! Football season is finally upon us. I’m usually knee deep in beginning-of-the-year school things when football starts. This is the first year I think I can remember that I’m not too busy to enjoy it! I’ve got a little bit of a spread planned for this weekend…wings, bang bang shrimp (a la Pinterest), and a fabulous layer dip I thought up this week! Prepare Rotel dip by cubing Velveeta into 1″ pieces, putting into a microwave-safe dish, and pouring can of Rotel and browned sausage over the top. Microwave for 2 1/2 minutes, stir, and microwave in 1 minute increments, stirring in between, until melted. In honor of football season, I thought I’d look back at our football seasons of years past! Look at those babies! This is our first homecoming that we were dating, so 2006. This was 2006 too…LSU game I think? I remember it was cold. These are some of the girls in our tailgate group – sweet, sweet ladies that I can’t wait to see this year! This is 2007, right before we got married…at the Florida State game in Jacksonville. Our tailgate group did a shower for us at the tailgate the football season before we got married! This is at that tailgate, with some more sweet friends. 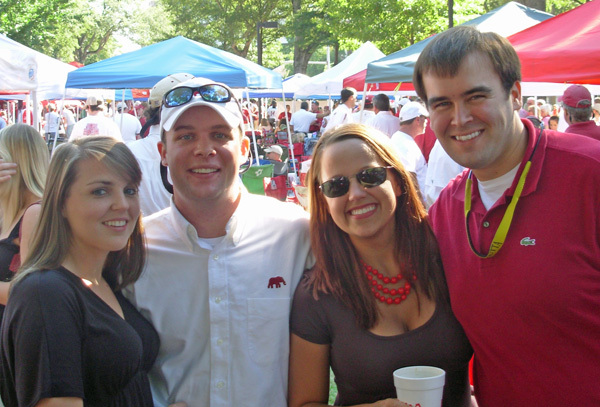 This was 2007 – I think the Arkansas game, I’m not sure. We were this close to Nick Saban! One of the only advantages to being a 6th year senior…the tickets. The Sugar Bowl where Utah State handed our TAIL to us…2008. And from January of this year…the first national championship we actually went to! (Emma Ramey was there too!) Well, I say that – we didn’t actually go to the game, because I didn’t want to mortgage my house for football tickets. 🙂 But we were in New Orleans for it.